Pretty lights and buttons to press. We want one. Alongside the new Bogner Alchemist amps that it is set to distribute and the JM-4 looper stompbox, Line 6 had other exciting new products up its sleeve at Frankfurt Musikmesse. As well as announcing new 400 and 750-watt LowDown bass amplifiers and the POD X3 Pro, we were most enamoured with the company´s new M13 Stompbox Modeler. Although nobody outside of the high-security Line 6 development bunker has actually heard the thing yet - there was only a prototype enclosure at the show, although this seemed pretty rugged - the signs are good. Many of you will have previous experience of Line 6´s modelling stompboxes, and the DL4 in particular seems to feature on many a professional player´s pedalboard. 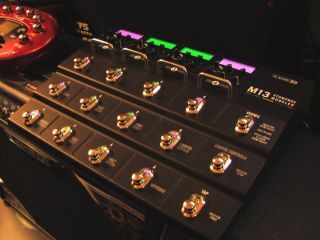 The M13 delivers not only many of the sounds generated by the existing Line 6 pedals, but also features a dedicated 28-second looper alongside its compliment of 74 modelled stompbox effects, 12 combinations of which can be recalled at any time. Visit the official Line 6 website for the full specifications. The M13 has a UK RRP of £398.33 and will be $699.99 stateside.